It was always our intent that our planning year would still provide development opportunities for artists. Artists sit at the centre of what we do, both as knowledgeable commentators on their development needs, and as advocates for their communities. And then, there are commissioned projects, artist led research, which is where things get really exciting. Combing through the daunting amount of artistic networks that have proliferated over the past seven years of the festival, we settled on five artists. These are people whose practices we believe resonate with what it is we’re trying to do, who can get to the heart of what we’re trying to achieve, who will ask us chunky, difficult questions and illuminate new directions and possibilities. 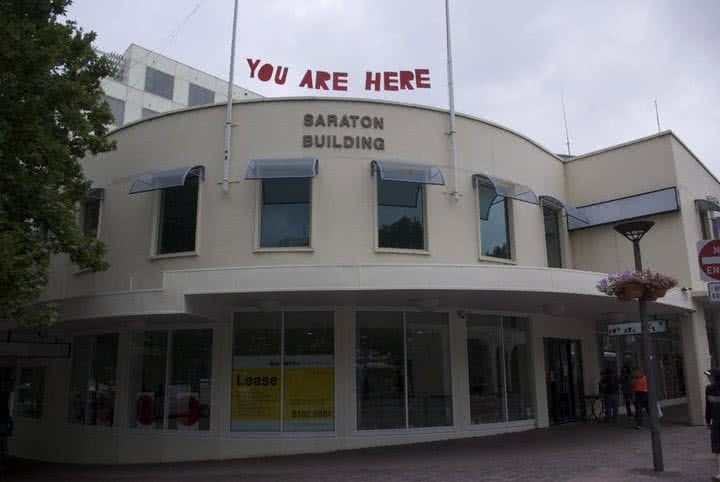 b) reflect on Canberra as a city and as a situation for artistic practice. How has the city changed since You Are Here began? What is lost, and what is gained? What spaces intersect with our aims? What use is art in the making of a city (for right or for wrong)? And so on. 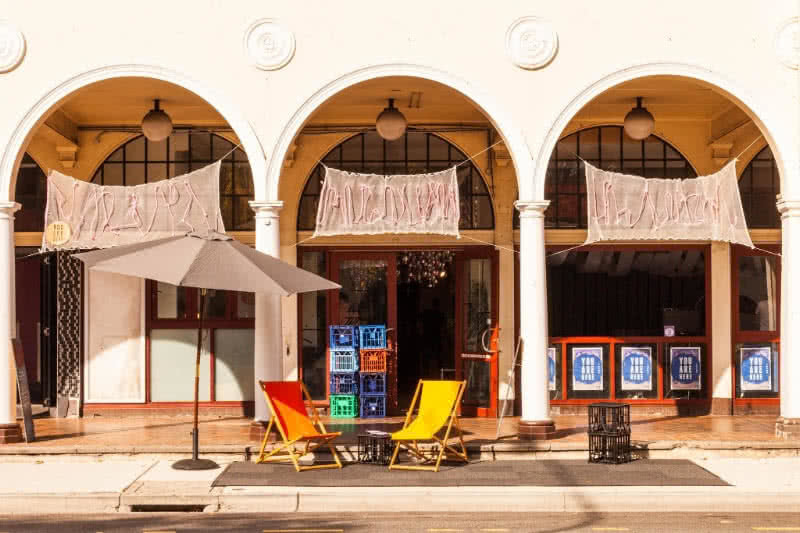 Most of all, we want to be surprised and challenged, to gather a deeper and broader understanding of Canberra and its arts sector than we could create ourselves. I love the way that Dan’s work manipulates and controls my perceptions and forces me to confront the way that perspective shapes my reality. 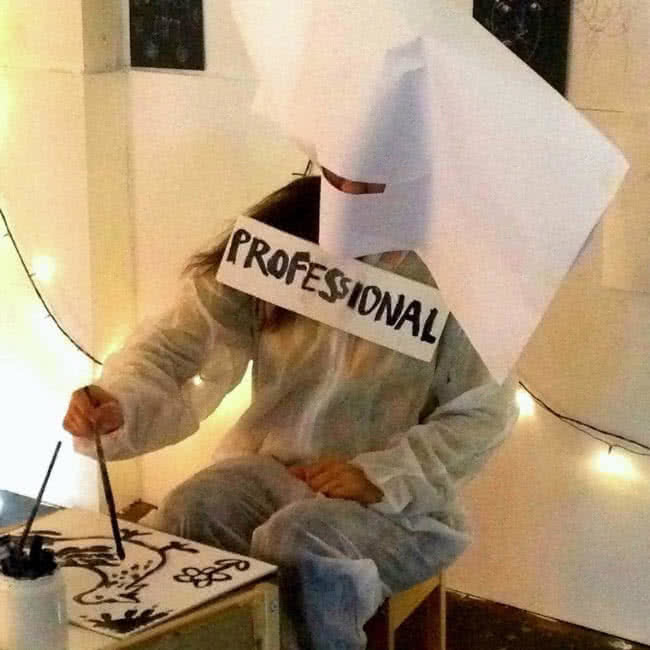 He’s constantly working to master different art tools, not just because the tools themselves are exciting, but because they give him more and more ways to make us sit in the sensory experience of others and confront the biases of our own experience. His project pitch to us was both dauntingly ambitious but also made us break out in manic smiles at how exciting the concept is. Of our five artists Dan is the one whose work I am least familiar with. We were at the ANU School of Art and Design at a similar point in time, but passing like ships in the night. I knew him as a photomedia artist, but in recent years have heard a lot about him as an artist who takes on sprawling, unwieldy concepts–goes where others fear to tread–and has the skills and connections to embark on them. To me, that’s peak You Are Here, to take on the near impossible, to grasp at a glimmer of something. It’s famously said that ‘everything’s been done’, but when you get talking with a mind like Dan’s that saying suddenly loses currency. Em is dream sort of writer to throw at big messy topics, for a couple of reasons. Firstly there’s her total command of seemingly all writing forms, her unerring sense of which form and shape to apply to the moment at hand. Second is the breadth of what she can hold in just a few lines- sharp sensory detail, brutal critical evaluation, the weight of personal history, wry warmth and a great levelling sense of the absurd. Any few lines of her stuff tends to have all of that, and the idea of her turning that incredible focus toward the ongoing project that is You AreHere both calms and terrifies me. I’ve been a long-time fan of Emily’s poetry and writing, but something really clicked for me when I came across her visual elements, and the material she was collating/responding to via Instagram. She has a very sharp sense of the intersection of environments and inner lives. Of structure vs. chaos, intent vs. reality and so on. Or at least that’s how I read it! She is currently undertaking her PhD, and there are some startling crossovers between her research interests and ours. I can’t wait to see Canberra through her lens. This is my first time working with Byrd, it’s always wild meeting someone in person for the first time when you’ve been seeing and enjoying their work for years. His work set me up to expect him to be self-possessed and confident, which he is, but his other immediate trait is curiosity. His questions aren’t anxious attempts to place himself within a situation (like mine often are), but stem clearly from a simple desire to know and understand. That inquiry without projection or pre-judgment is easy to relate back to his work, he’s just the kind of artist that you want to spill all of your secrets to. Byrd is one of the most prolific artists I know, and one of the most generous. He works in the open, constantly producing, constantly present. And manages to carve out a sustainable practice from a renegade root–but quietly, without fanfare. His work is so embedded in the Canberra CBD and surrounds that it’s part of the fabric, from tiny interventions to huge mural walls. And in turn it is informed, in perhaps unexpected ways, by the spaces, people and nature of this place. I consider Byrd to have one of the most highly developed understandings of the Canberra city and psyche of anyone. Its history, present and future. Over the past decade, (or is it more like fifteen years?!) 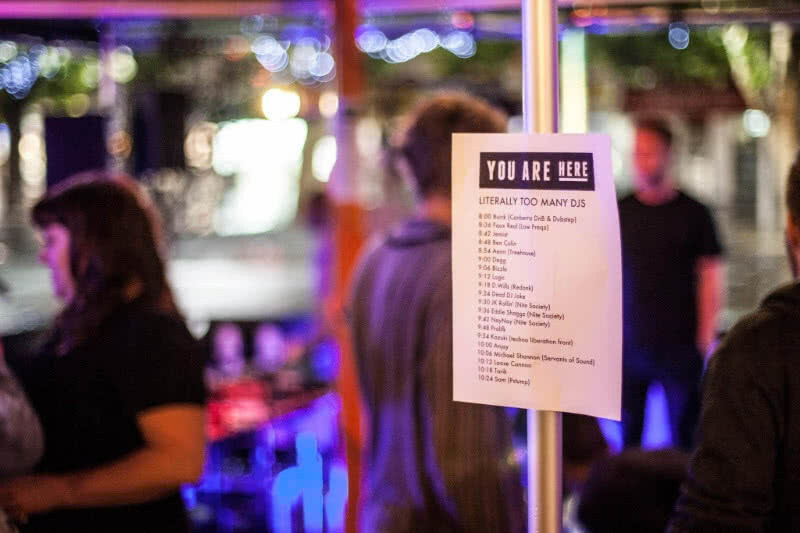 Shoeb has had a real omnipresence in Canberra’s music scene. But there was a point, or points, at which Shoeb moved from the sort of standard gig to spearheading and sound art community and events that pushed into new territories and made everyone step it up, artists, performers, audience, all of us. I saw Shoeb’s practice gathering momentum, saw how different and exciting it was. And I saw just how hard she worked, making work and producing others. What we are seeing now is an artist really coming into their own, inimitable, while supporting rafts of other musicians, and driving so much of what’s happening in the scene. I feel a lot of kinship with Shoeb, I feel like we’ve been on similar arcs–musicians who can’t help sprawling all over the genre map, hunting for more and more collaborations, and then having to move further out into entire other artforms. Shoeb is a compulsive artist, and a compulsive responder to the other artists around her. In discussing what she would do for us she zeroed right in on an investigation of Yolande and my process as a thing to investigate and centre. I don’t think Shoeb would ever think of conceiving of any artwork apart from the relationships between the makers of said artwork, which is such a wonderful way to approach things. Ali has created something for almost every year of the festival. Every time she’s been the producer and central performer while also facilitating challenging collaborations for herself at the same time. She’s already rigorous and bold, already constantly completing work, which raises the question- what can a body like You Are Here do to further the practice of someone like Alison, beyond just presenting work? Of all our artists I feel that working with Alison will bring the questions around our creative producing models into sharpest relief. Alison was one of the first artists I programmed and produced way back in my first You Are Here festival in 2011. I had been firmly ensconced in the visual arts, but contemporary dance posed as a sort of gateway drug that opened me up to a universe of performative art forms and possibilities. Alison really stood out from the crowd. She still does! Her choreographic practice encompasses a wealth of applications and collaborations. She’s adaptive, responsive, thinks deeply and aims high, with a firm focus on the things that matter. All traits we’d like to share, really.